I am Joelle from a small cheese town in the Fox Valley, Wisconsin. I have created artwork for over 20 years. My paintings and drawings are in collections all over the world including, India, New Zealand and the United States. 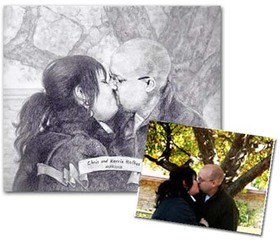 I hand draw portraits from your photographs so you can commemorate an accomplishment or capture your special moment in a custom work of art. Email a picture of your child, family, friend, business partner, or pet and let the magic begin. 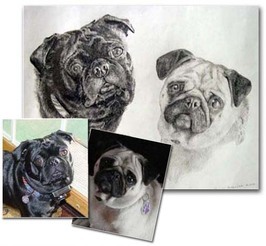 Hand drawings from your photographs are great for recognizing an achievement or commemorating a retirement. These items make great unique gift ideas for any occasion and always impress. This custom drawing was created using reference photos of friends, family and a specific wheelchair. The illustration depicts Christ telling the boys that one of them will spend his life in a wheelchair. One boy is depicted volunteering in order to save the others. This is a commemorative portrait of Jean Caudle, a proponent of reading education and one of the biggest supporters of the University of Wisconsin, Oshkosh. 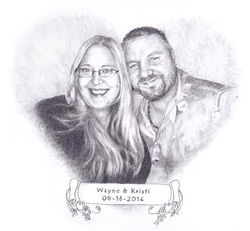 This custom hand drawn portrait includes a heart-shaped background with a scroll showing the wedding day of the customer and his wife which he gave to her as a gift on their special day.